I love to feed my kids healthy snacks that they don’t know are healthy. I am kinda sneaky that way. They have hit that stage of childhood where they eat …constantly. I am not sure how their metabolism works, but I wish mine was on overdrive like theirs is. One of their favorite snack is chips (any kind); Plain, with dip, with salsa…you name it. I decided to see what they would do with Hummus, but it is kinda of expensive for the pre-made dip. So I made my own. It was a huge it, and great for dipping veggies too! A quick and easy homemade Hummus dip that the whole family will love! Mince garlic in blender or food processor. Blend in beans, adding water in small amounts, until pureed (may not use all of water). Add tahini, lemon juice, vinegar, cumin, and salt. Add more water if needed, for desired consistency. Place in serving dish; then drizzle with oil and sprinkle with paprika. I love hummus. I make one similar to yours and also make one where I add roasted red peppers into it. Yummy. Even the kids love it. We put it on sandwiches, use it as a dip for veggies, crackers, etc. It’s a good thing to have available. My 13 and 15 yr old boys LOVE hummus! I am a frugal (aka cheap) mom who just last night at the grocery store said “no hummus today” to one of my boys. Thanks for this do-it-yourself version that not only will make enough to last a couple of days-but looks tastier and healthier! We recently tried adding a bit of greek yogurt (up to 1/4 cup or so per can of garbanzos) to our hummus blend and loved it! 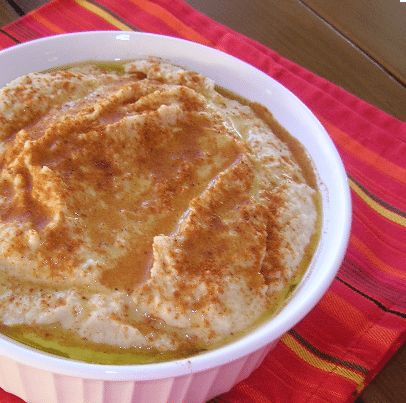 It makes the hummus fluffy and super creamy. I would love to make hummus at home, but where do i get tahini, i have all the other things already. We can’t wait to try this! Here is a suggestion based on my past failures at homemade hummus: Wait to add your water until the very end, or you may end up with too much liquid after it sits a while. You might find yourself blotting it with a towel before eating it! Not the end of the world, but a hassle none the less. God bless!